LAHORE: (Monday, September 10, 2018): Punjab University Vice Chancellor Prof Niaz Ahmed has said women’s education was a must because if we want to produce a great nation, we must produce educated mothers. 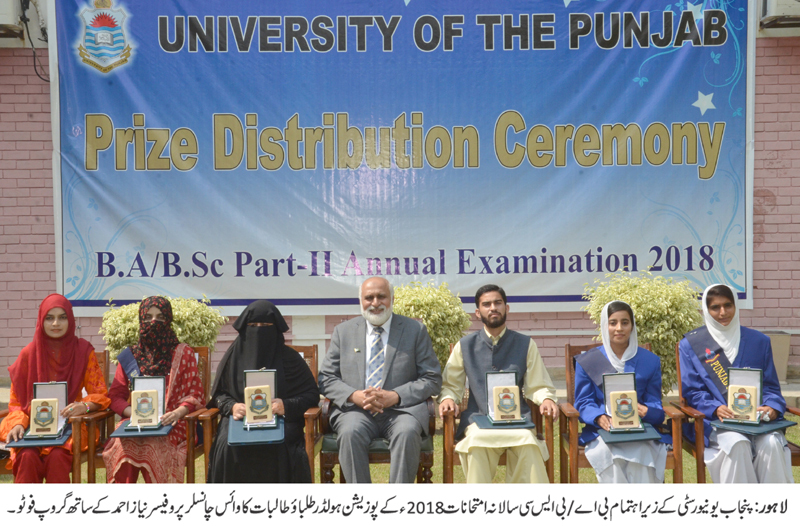 He was addressing the prize distribution ceremony for position holders of BA/BSc Part-II annual examination, 2018 at Al-Raazi Hall here on Monday. Acting Controller of Examinations Abdul Rauf, Additional Controller Raja Shahid Javed, deans of various faculties, senior faculty members, students and their parents were present on the occasion. 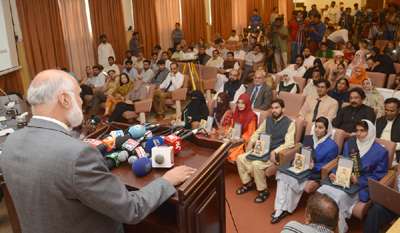 Addressing the ceremony, Prof Niaz Ahmed said that no nation could prosper without giving importance to education. He said that education must be our priority because we have no future without education. He said that PU administration aimed at producing quality graduates therefore we were making efforts to make our academic programs at par with international academic programs. He said that we were improving our BA/BSc degree program as our graduates must have skills relevant to their fields. He congratulated position holders, their parents, relatives and their teachers on their landmark achievement. 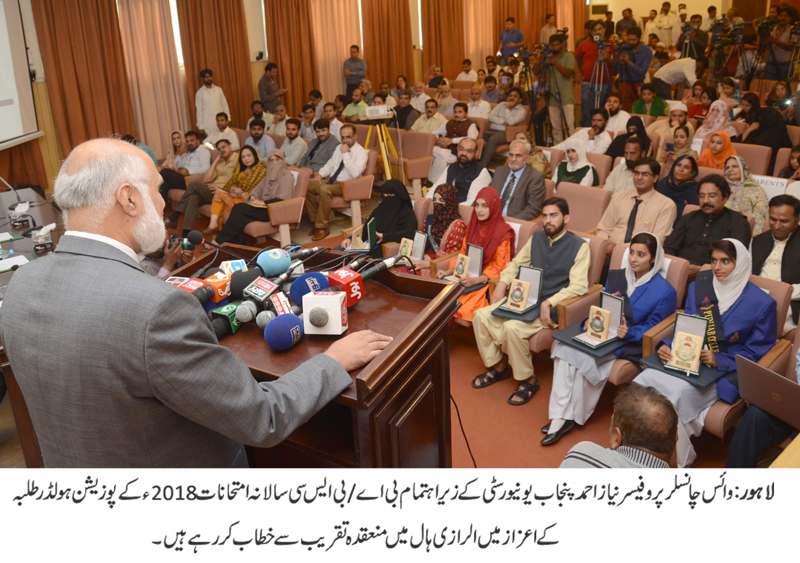 He announced to provide free education and scholarships to the position holders who want to study in Punjab University on campus. The VC announced Rs five hundred thousand rupees honorarium for the staff of Department of Examinations and one hundred thousand rupees for monitoring teams for showing outstanding performance. 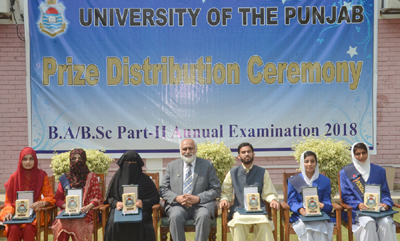 Addressing the ceremony, Acting Controller of Examinations Rauf Nawaz said that PU Department of Examinations gives examination of around 545,000 candidates appearing in different examinations every year. He said that the day-night efforts of the staff. He said that the BA/BSc examinations had been in conducted five division of Punjab, Gilgit, Skardu and Quetta. He said that the result of only 99 candidates was late out of 224,143 candidates.